After all the excitement of lunch at The Roof Gardens in London earlier this week, it's back down to earth again here in Sussex, as we hope for warmer weather and fewer showers! All the gardens seem to be running late because of the long, cold winter we had here, but here's one that looking fantastic, even on a grey day - Michelham Priory, near Hailsham - and what I love about this garden, is that it's never crowded. 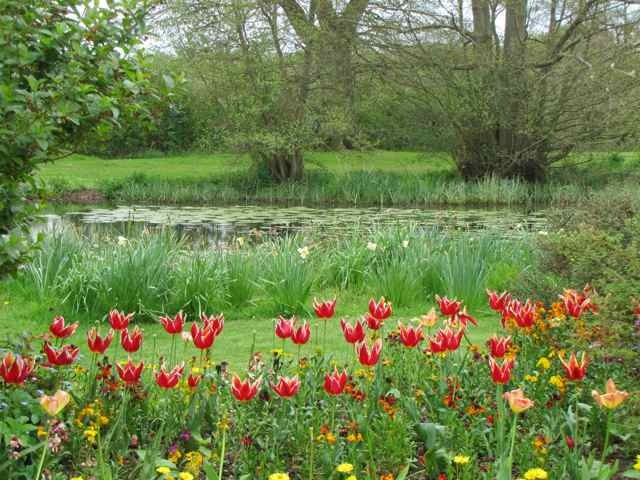 This is an extraordinarily beautiful garden, tucked away in the countryside near Hailsham, with a house that dates back to 1229, and boasting the longest medieval water-filled moat in the country! But what really strikes you about Michelham is the sense of peace there as you wander through the garden admiring the planting. 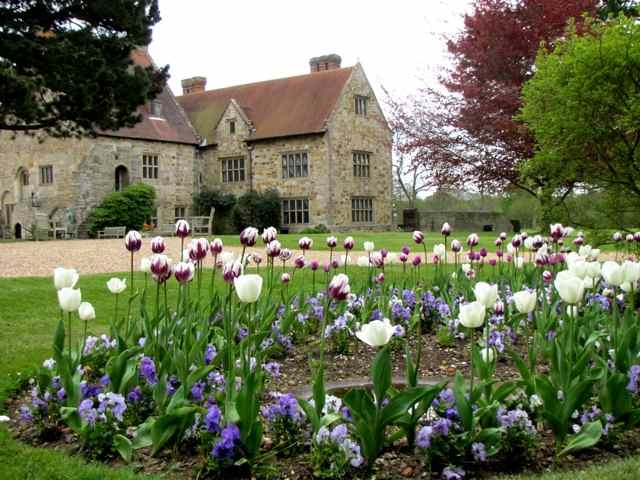 Originally the site of a monastery, there is even a small Physic Garden and a restored Cloister Garden (below), but what will really strike you here is the density of the planting and the glorious border displays that change through the seasons - right now the tulips are still in bloom - but in June the densely planted borders will be resplendent. 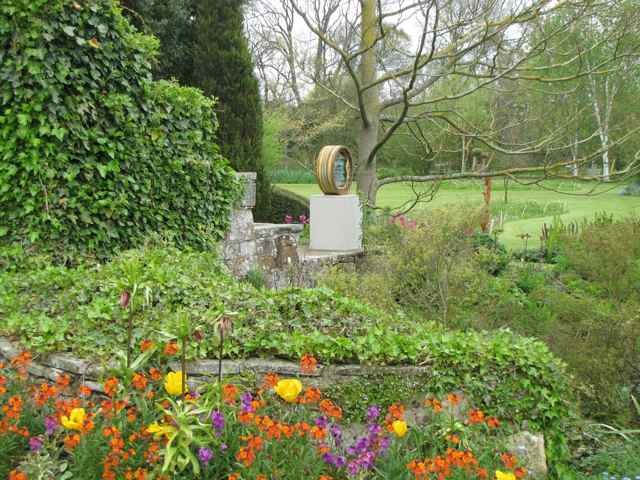 There is also a restored mill house and a regularly changing sculpture exhibition here at the Priory, with all work by local artists. 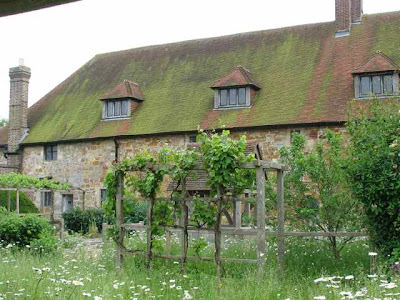 This really is a garden to spend a little time in and allow yourself to sit and enjoy the countryside. 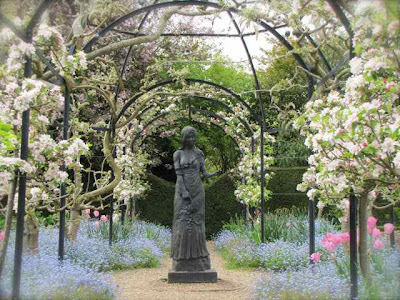 You can easily get to Batemans - one-time home of Rudyard Kipling - from here, if you want another local garden, or if you visit in June, there are notable NGS gardens open, including Clinton Lodge and Hailsham Grange. Other nearby gardens include Monk's House and Charleston, which I'll be reviewing in the next few weeks, but in the meantime I'm off to Somerset next week to look at some of the great gardens there! Quite an amazing garden. I am looking for gardens to visit in the UK when I am there with my family from June 17-26. Not sure if we will get this far down into Sussex, but sounds like a wonderful place. Might you have any garden recommendations near Cardiff? We are starting our trip there. Waow, such beautiful gardens you visit! Douglas - great that you are coming to the UK - if you hit the UK Gardens link on the RHS of this blog, you'll find a list of gardens in Wales, right near your starting point! This is lovely ... I especially love the serenity in your first photo! The London roof garden was amazing too! What a life you lead! Thanks for sharing it!! Wow, I am in love with the first image. The blues, pinks and whites are just gorgeous. What lovely beds. I just love galloping with you to all these beautiful gardens. LOL! I enjoyed scrolling down, looking at the gardens in your posts. I love them all. I am amazed with the beauty of the old buildings as well as the plantings. I spent the most time in your latest garden post. Thanks for your nice comment on my GBBD post.